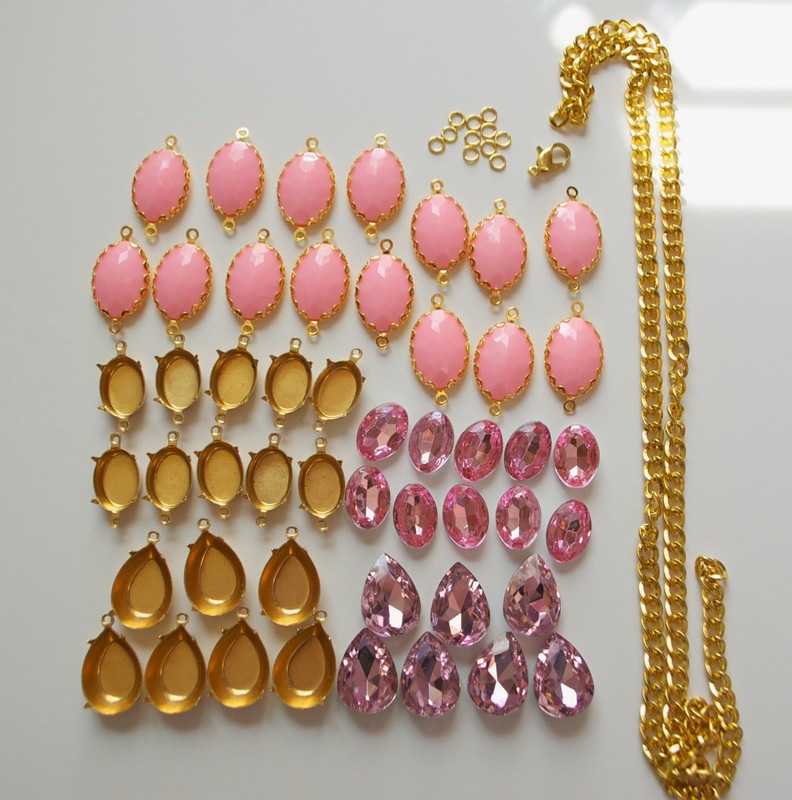 Alright ladies...this next jewelry tutorial sums me up pretty well. 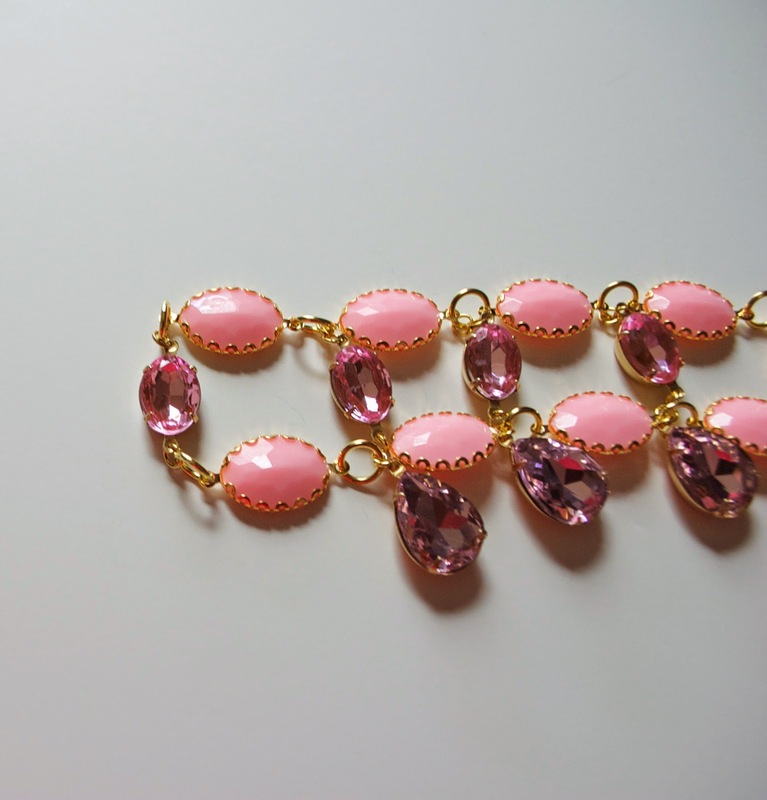 It's got pink AND crystals AND it makes a statement. Sound like your cup of tea?? 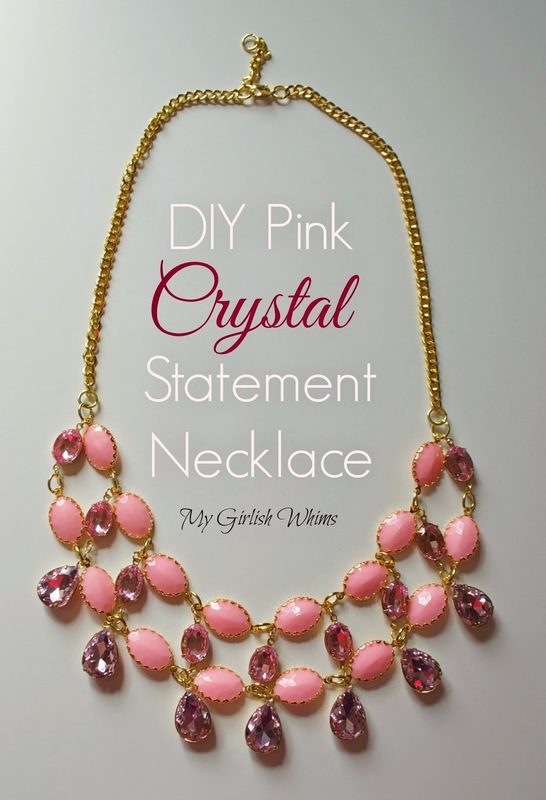 Even if it's not stick around, you can still use this technique to make other types of necklaces! This is the second necklace I've made with supplies from Beadmixer (last crystal tutorial found HERE!) and I just love working with these crystals. They make a statement however you use them, but I really had fun stretching my design abilities to make something a little different with this necklace for a fun statement piece. 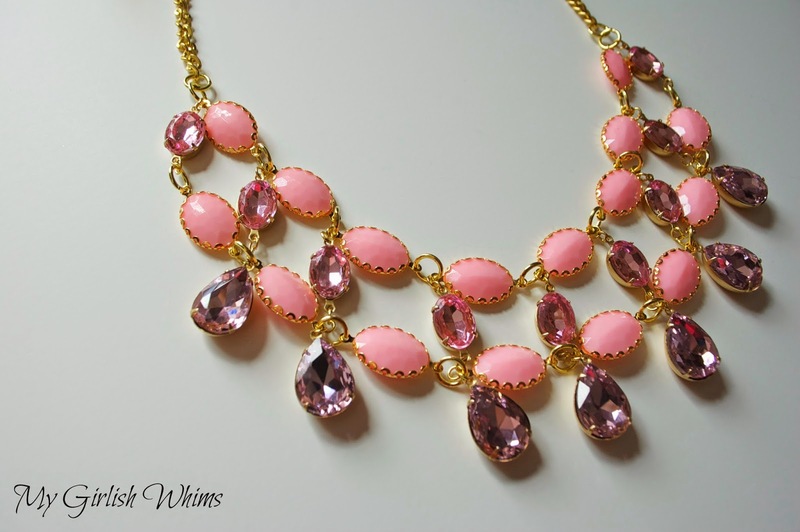 These pretty crystals from Beadmixer are the star of this necklace. 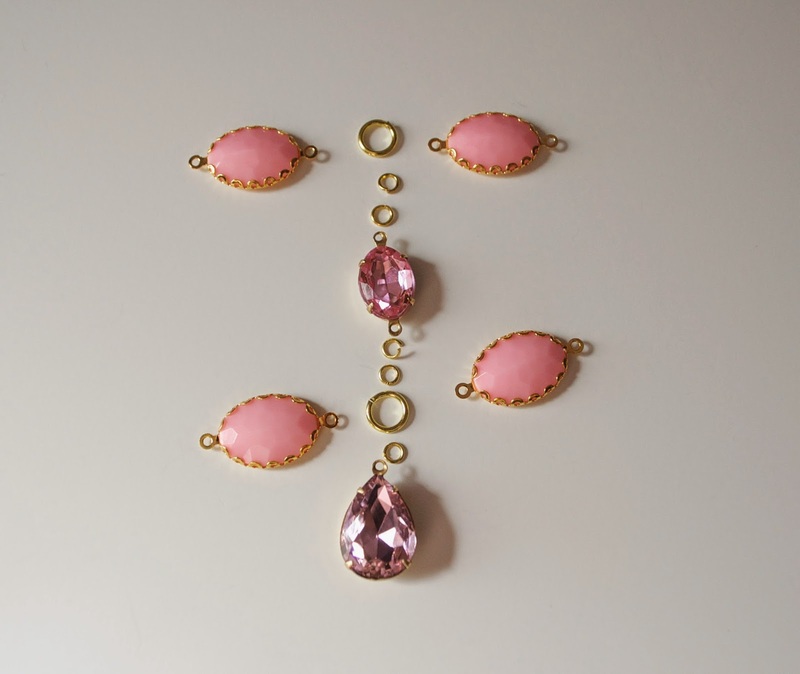 I used: pear shaped pink crystals, pear drop settings, oval pink crystals, and oval settings. 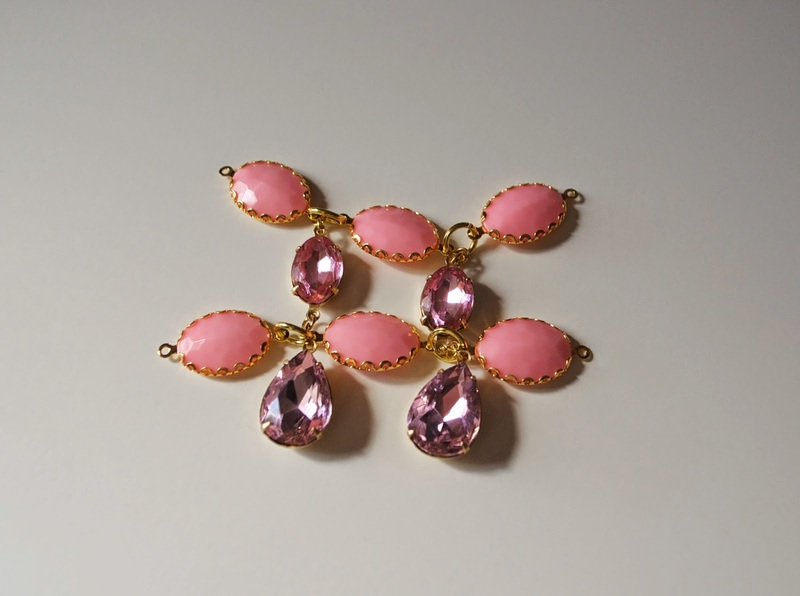 I also snagged some pink connecters from my stash as well as some chain, jump rings and a clasp. 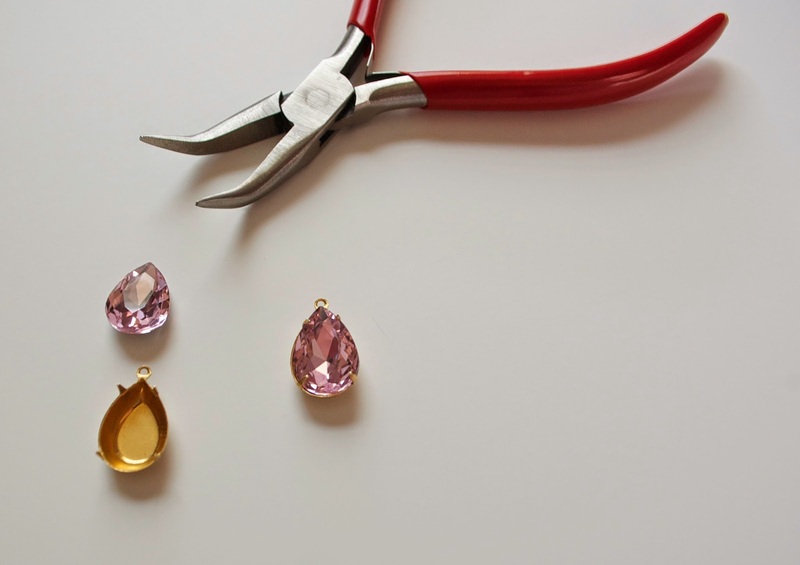 Start by placing the crystals into their respective metal settings and squeezing the prongs shut to hold the crystal in place. Be careful to not scratch the crystal; if you're worried your hand won't be steady enough, you could dip your pliers into Tool Magic to protect the crystal. That way everything should lay flat and face forward. Use needle nose pliers to open the jump rings to attach everything together. 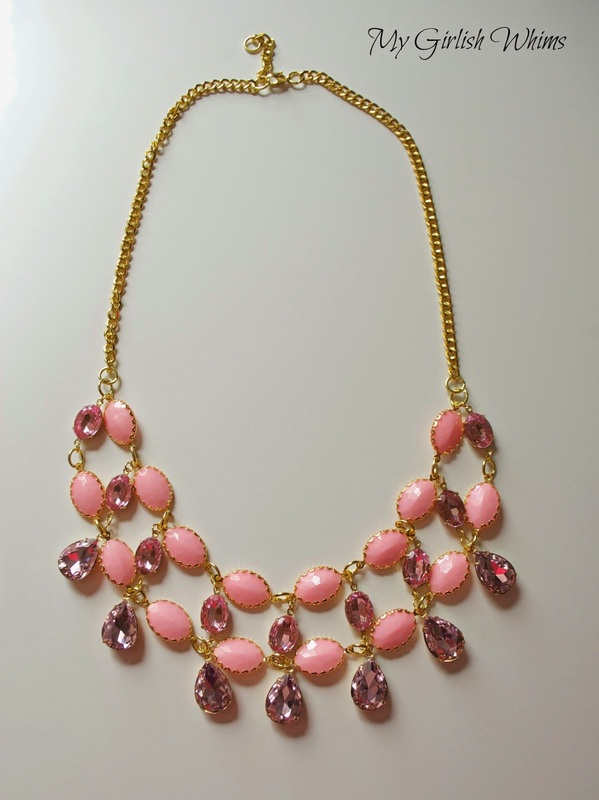 Until you have a full beaded bib necklace! 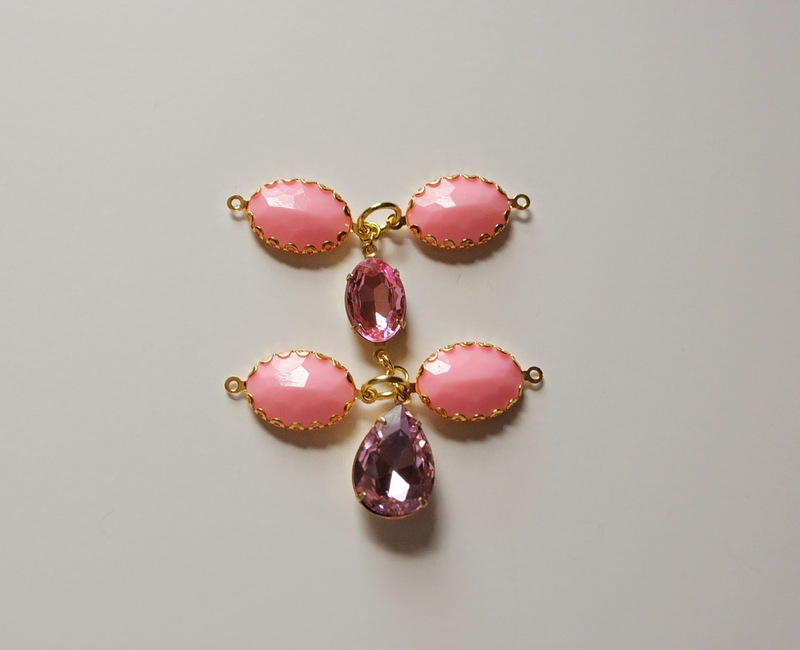 Finish off the bib with two more oval crystals. Use more jump rings to secure in place. 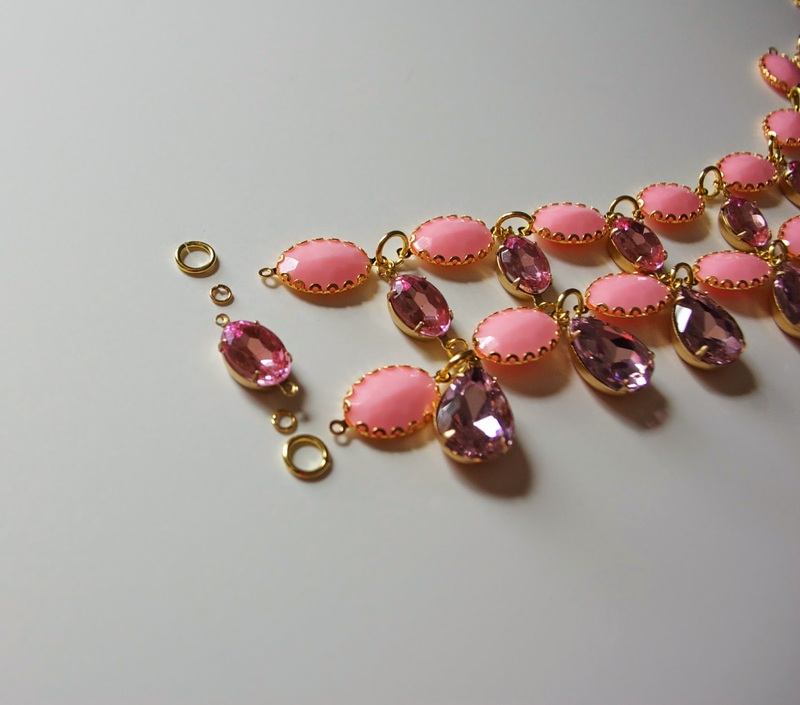 Cut two lengths of chain to attach to either side of the necklace. 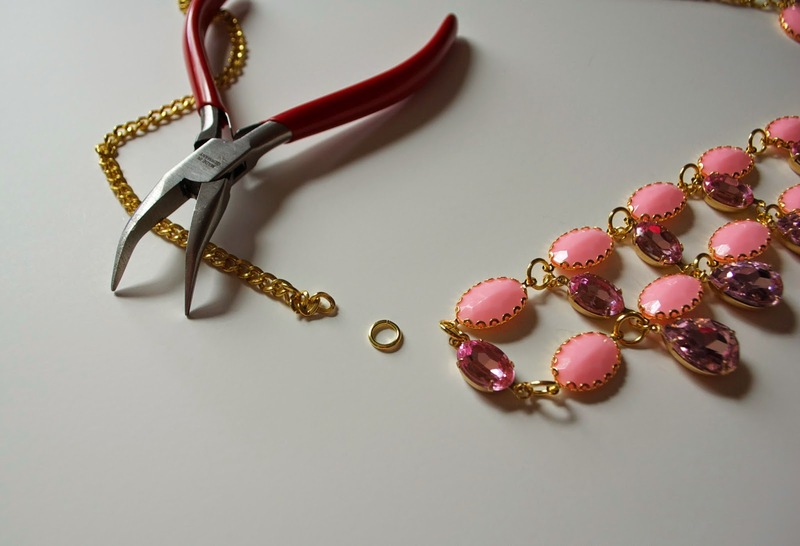 Use a 6mm jump ring to attach the chain to the top end jump ring on either side of the beaded bib. Last step is to attach a clasp to the chain ends! I also included a small extender chain to give me two different length options. 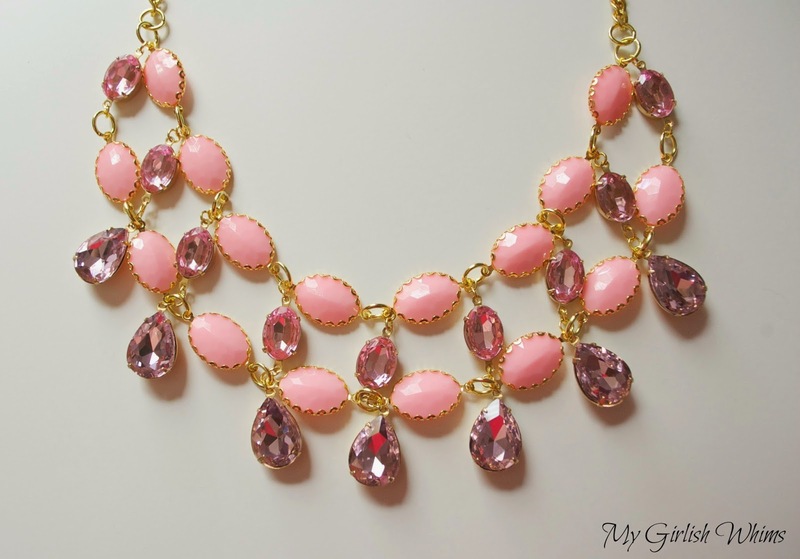 After the clasp is on you've got yourself a new pink and sparkly and girly necklace! 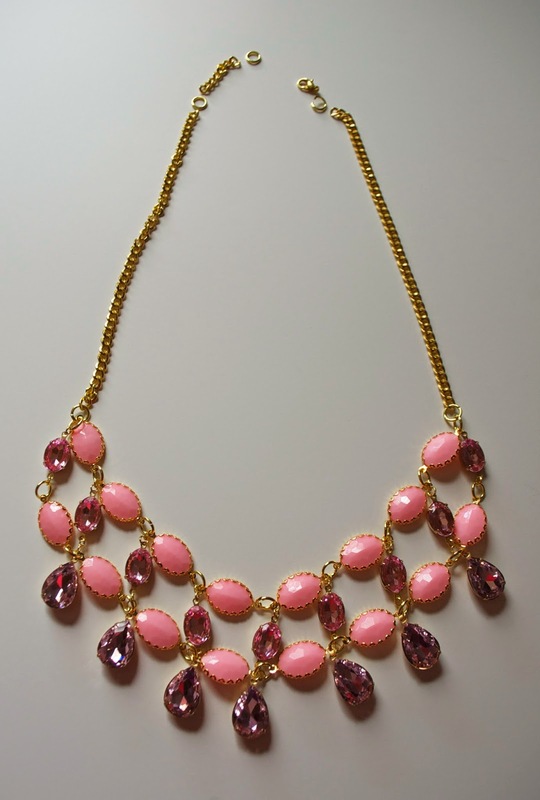 I think this necklace would look great with a strapless maxi dress for the summer. Of course I don't HAVE a strapless maxi dress. I don't even have a maxi skirt. I've been trying to find one I like FOREVER and just can't commit to anything. Maybe this new accessory will spark SOME idea next time I'm out shopping so I can finally commit to one. Love this combo, especially the pink connectors! I love how you paired the different shapes and textures together. Another piece for my inspiration board! This is gorgeous! 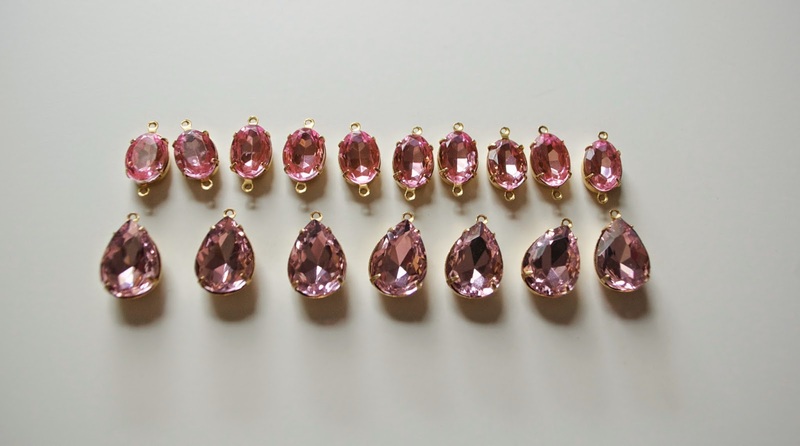 I have recently started to explore the bead section at Michael's and it is so overwhelming, hopefully one day I can make something as pretty as this! 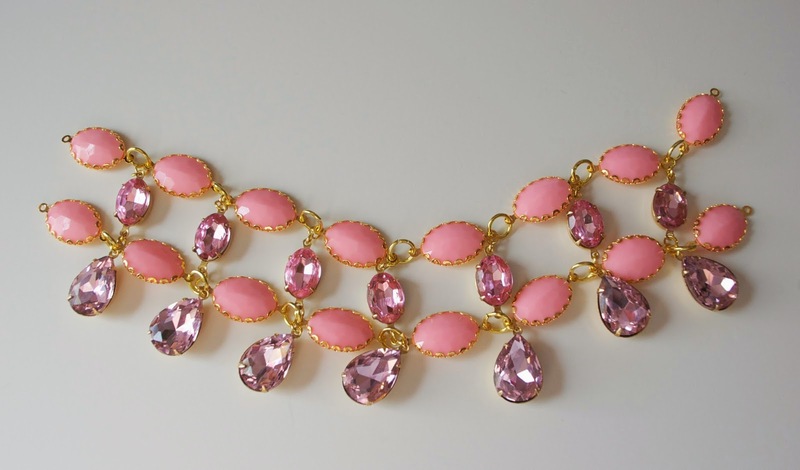 I love those pink connector beads! I can't stop looking at them! There's something just so...perfect about them!